Oh its nice to see Halloween---so colorful and fun! Thanks for joining in at LGS! What a fun layout. Love the frame. Thank you for playing along with us at The Studio Challenges. Cheryl, great to see another layout of yours! Putting the lyrics around your frame from the "Haunted House" and linking it so we can hear it on youtube is such a great and fun idea! Love the google eyes,too! Halloween is my favorite time of year so I will be starting to scrap some pages too. Thank you for joining us again at "Picture This" and I look forward to seeing more from you! 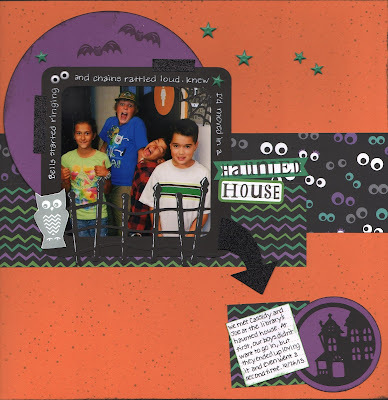 Love you Halloween layout...create use of the arrows! Thanks for playing along with Lasting Memories!!! This is a wonderful layout! I love the theme and all the challenges you have combined! Thanks for sharing with us at Picture This! What a great, in-season page! Halloween pages are some of my favorites to make! Great layout - thanks for playing at Lasting Memories! Nice page! Thanks for joining us @PT! Love your Halloween colors!!! This is a great page!!! Thanks for playing along at PT! Very fun photo and layout - like the way the arrow hops us from one part to another. Great layout to incorporate the star theme. Thanks for joining us at PT. It's lovely, I like what you did with the frame. Cool layout!Love your stars.It just like the star to shine on Halloween.Thank you for playing with us at Picture This. Beautiful layout! And a great take on the sketch. Thanks for joining us at LGS! It's lovely Halloween page!Thanks for joining us @PT!